The NBA offseason was filled with activity, as LeBron James, Kawhi Leonard and Dwight Howard all found new homes. Of course, not every transaction will pan out, and with that in mind, The Crossover considers which team will be the biggest flop this year. Of course, not every transaction will pan out. With that in mind, we set out to predict the team most likely to fall short of expectations. Is it LeBron's Lakers? The Jimmy-less Lakers? The Crossover asked its staff to predict the 2018–19 season's biggest "flop" team. Technically speaking, it's hard to predict Lakers disappointment when expectations are already all over the map. What's the goal here? How are we measuring success? One attempt at a standard: excluding the lockout year, LeBron James has won 50 games in 11 of the past 12 seasons he's played. That probably won't happen this year. This Lakers team has no identity defensively, no credible big men, and an offense that will be a work in progress. Luke Walton has a rotation that goes 10-deep with players who are either unproven or proven to be unreliable. LeBron will have to be superhuman to make any of this work. Whenever he leaves the floor, things will get awfully dicey. There will be intervals when this Lakers smallball experiment looks phenomenal, but the lack of a non-JaVale big man is going to be a real problem. And while that could certainly be fixed with a mid-year trade, there's one other concern that's more abstract. If we accept that LeBron has to dominate to give this team a real chance, it's worth nothing that over the past few years James has shown he's at his best on teams that have the firepower to compete for a title. He was only half-engaged for long stretches of last season in Cleveland, and it ultimately prompted a massive overhaul at the trade deadline. While those Cavs trades didn't really fix anything, they did succeed in one respect: the deals gave LeBron a reason to care again, and when LeBron is engaged, he's still the best player on earth. The question, this year, is how long he'll remain engaged with a Lakers team that's not quite ready to reward that investment. Despite these favorable conditions, the bet here is that Washington flames out so hard in the 2019 playoffs that one, two or possibly all three of the following things occur: 1) GM Ernie Grunfeld is finally fired, 2) coach Scott Brooks is fired, and 3) the core trio of Wall, Beal and Otto Porter is broken up next summer. The most likely culprit to induce this downfall is Dwight Howard, an aging and anachronistic center whose short stints in Atlanta and Charlotte were precursors to regime changes. If the well-traveled, poorly-received Howard isn’t the scapegoat come May, then keep an eye on Wall, who is owed more than $185 million over the next five seasons and whose on-court impact lagged far behind his self-perception last season. Unless the franchise point guard delivers a big bounce back campaign and a playoff breakthrough, Washington should seriously explore pivoting to a Beal-centric future next summer. The Wizards are therefore sprinting against the clock, hoping to finally approach their considerable ceiling before getting so sick of each other that they can’t carry on any longer. The slight problem in the Wolves obliging Jimmy Butler’s trade request is that they haven’t yet learned how to win all that many games without him. Some of that is contextual; Butler was such a driving force for Minnesota last season that the Wolves seemed to have trouble striking a proper balance without him. Consider their likely season apart a learning experience. Karl-Anthony Towns will learn to lead on the job. The flaky Andrew Wiggins might become the team’s top perimeter defender by default. What comes back in any deal for Butler is a mystery box, though the fact that Minnesota will have to piece together its season on the fly makes for tough sledding in the hyper-competitive West. With as many as 13 teams challenging for a playoff spot, can we really be sure the Wolves—easily the most volatile of the bunch, given their circumstances—are all that likely to qualify? I’m just not quite sure how this is going to work. LeBron consistently makes everyone who predicts against him look like fools... but this roster? In the Western Conference? Starting JaVale McGee at center? You have to understand, I don’t think the Lakers are headed for the lottery. I do think it would be absolutely shocking if they made the conference finals. Considering LeBron has been in the NBA Finals for the length of two presidential terms, it would be kind of a flop if he went out in the first or second round. L.A. has no depth at center, questionable shooting at point guard, and a cast of veterans (Rajon Rondo, Lance Stephenson, Michael Beasley, McGee) who are unlikely to help on the defensive end—even though their signings were touted for that purpose. 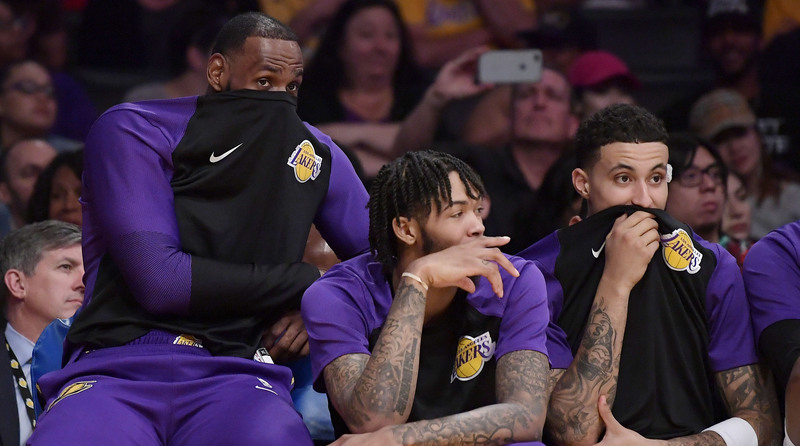 Sure, Brandon Ingram could become a star alongside Bron, Lonzo could take the leap, and Josh Hart could eventually start. But what’s the ceiling of that group? LeBron is, perhaps unfairly, graded on an insane curve. For the greatest player of all-time—who seems to still be in his prime—to miss the conference finals, to me at least, is a flop. As presently constructed, I don’t see the Lakers making it that far. Given how tightly packed the Western Conference was at the end of last season and factoring in likely improvement among some of the teams that missed the playoffs, it feels like one or two teams are due to take a step back. 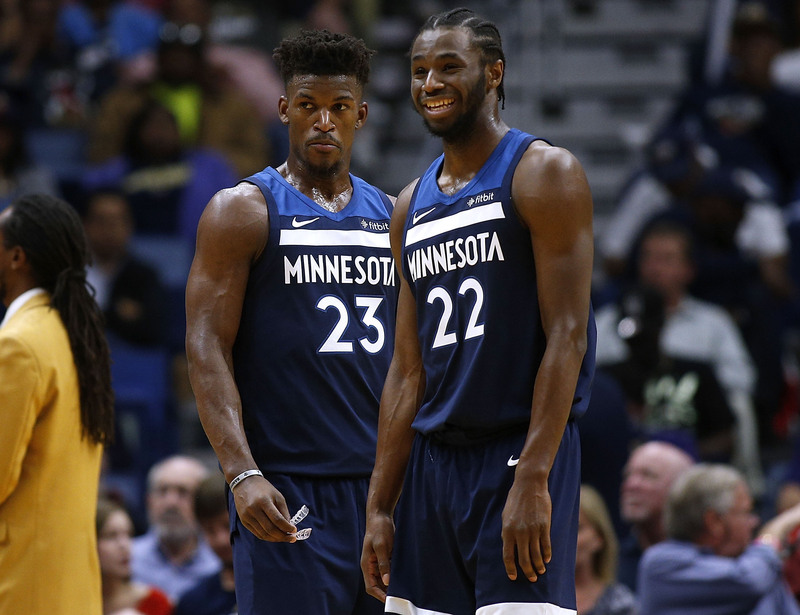 With Jimmy Butler on the way out, suspect depth and what could end up being a major over-dependence on Karl-Anthony Towns, the Timberwolves could find themselves in a trouble spot rather quickly if their season gets off to a slow start. On some level, things depend on where Butler goes, when it happens and what the Wolves can get back, but being stubborn is helping nobody. Even if Butler were to grit his teeth and report to the team early in the season, the potential for sustained internal conflict makes it hard to get too excited about that scenario. If Minnesota moves him and hauls in a rotation player or two, overachieving could be on the table, but the best return for the health of the franchise would include a combination of young players and draft assets (it’s just not clear if Tom Thibodeau wants that). It might take an Andrew Wiggins leap for this team to get back to the playoffs, and that might be a sucker bet. Red flags are everywhere here. The Spurs are down Tony Parker and Manu Ginobili as well. Can Dejounte Murray really handle the reigns of the playmaking? Will DeRozan's ball-dominance stunt that potential growth? There's a reality where Gregg Povpovich makes these pieces fit. But I'm skeptical this group will be able to uphold its preexisting standards. 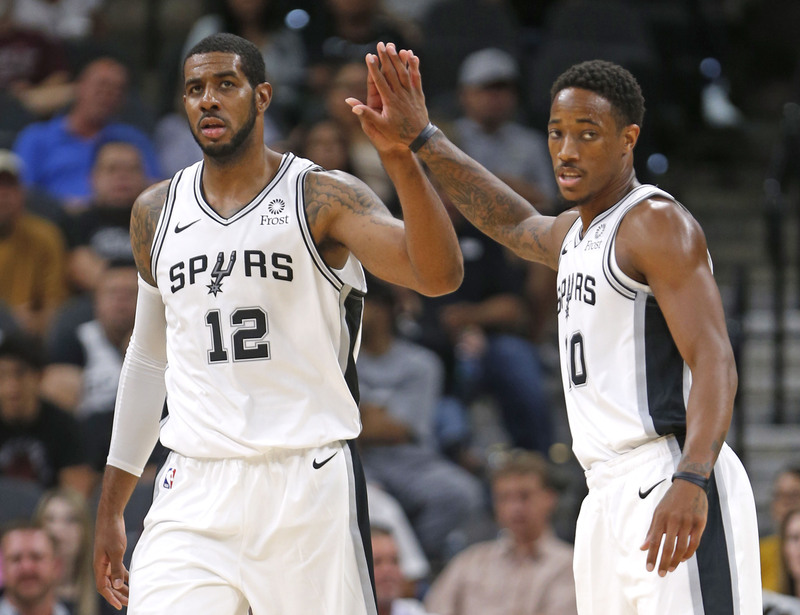 A pick for our 2018–19 flop team should theoretically come from the Western Conference. With up to 13 teams (again, apologies to Phoenix and Sacramento) potentially vying for playoff spots, a team with high expectations is bound to spend their summer at home. Maybe the Boogie-less Pelicans slog through the regular season, and there’s a good chance Minnesota’s situation continues to devolve. There aren’t enough spots in this conference-wide game of musical chairs. But the possibility of a Dwight Howard-fueled implosion is too juicy to pass up. The Wizards enter this season following a dispiriting 2017–18 campaign filled with bickering and frustration, culminating in a six-game exit in round one of the playoffs. Washington lost nine of its final 12 regular season contests and never rebounded for the postseason, limping home without a conference finals appearance for the eighth consecutive year in the John Wall era. So what better way to clear the air than to bring in Howard, who is now joining his fifth team in eight years? Along with the headaches that invariably come with signing D12, it’s not as though he’s a stylistic fit in Washington, either. The Wizards will likely spend their season alternating between thrilling Wall fast breaks and plodding Howard post-ups, keeping Scott Brooks in a continued state of anguish. The eight-time All-Star led the league in travels, offensive fouls, three-second violations and goaltends last season—not exactly a winning strategy. I get that the Wall-Gortat pairing had to end after last season’s war of words, but did one of the league’s top pick-and-roll options have to be replaced by Howard? That just seems cruel. Washington has an impressive trio in Wall, Beal and Otto Porter (who continues to evolve into one of the top 3-and-D wings around), yet things feel stale in the nation’s capital, and the depth on the Wizards’ roster is shaky at best. Austin Rivers isn’t the solution to Washington’s hunt for a third guard, and the Wizards will miss the solid screening and interior dirty work of Gortat. This team will reach the playoffs in the sham they call the Eastern Conference, but the buck should stop there. Expect another early exit for the Wizards, and another year of Wall’s youth down the drain.